I started Herstmonceux back in 2012 wanting to recreate a sleepy Sussex station and two years later took it to Tonbridge show for its debut.. Since then it has done 10 shows and picked up a few awards but its outing to Epsom & Ewell MRC exhibition in April will be its last for the foreseeable future. I have been lucky to have a good team of friends to help me take it out on the road the last six years and we’ve had some great times at the shows we have done. It has also been good to meet readers of my blog that have followed its progress and make new friends along the way. This weekend sees Herstmonceux making its way to Railex which is regarded as one of the best shows in the country. As I said in my post back in April, Herstmonceux hasn’t been out since last July so much of last weekend was spent cleaning the layout and tidying up bits that needed attention. Rolling stock was checked, fixed where needed and packed away ready. Yesterday it was the turn of the locos to get a good clean and repair any damage. I usually give them a good run and oil as most of them haven’t been used for a while. Wheels are cleaned with a cotton bud and IPA, surprisingly most of the wheels were fairly clean. Why “Going home”? Well I was born in Aylesbury and grew up going to Railex with Dads trade stand, back when it was in the Civic Centre. One highlight was being lucky enough as 10 yr old to operate Jas Millham’s Yaxbury for the whole weekend, must be why I have an urge to build something in S gauge! So this weekend is rather special now that i’m getting to take one of my layouts to my home town show. All thats left is to make sure I’ve got everything and pack the van tomorrow. One of the trains in Herstmonceux’s timetable is a Summer Special. Various inter-regional specials ran in the summer months. Some bringing holiday makers down to the Sussex coast and others taking people to different holiday destinations like Birkenhead or Blackpool. These usually had a SR Schools or Mogul replacing the loco that had brought the train in from another region although sometimes the loco from the other regions made it onto SR metals like Black 5’s, B1’s and even the odd 8F! The idea for the one on Herstmonceux is it is on its way down to Hastings after being split at Three Bridges with the other part going to Brighton. The four coach train is made up of a couple of ex LNER Thompson’s, a Gresley and ex LMS Porthole and motive power is usually a Schools, K class or Black 5 if someone brings one along. I had been looking to get a loco just for this train for a while but didn’t want to spend too much as it only runs a few times over a show weekend. So I recently picked up an older Bachmann B1 model for a good price. Being the older model it maybe doesn’t have as much detail as newer models but then I didn’t pay half as much as what the new ones cost and it gave me a chance to do a bit of modelling. 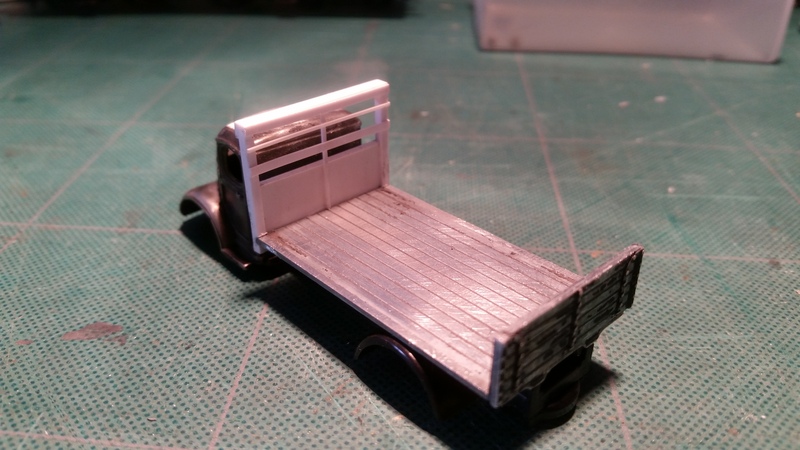 This was kept fairly simple, the plastic coal in the tender was cut out and a new inner made then some real coal added, new brake rigging made, loco crew added and some light weathering. I may add a bit more weathering but for less than £30 i’m pretty pleased. 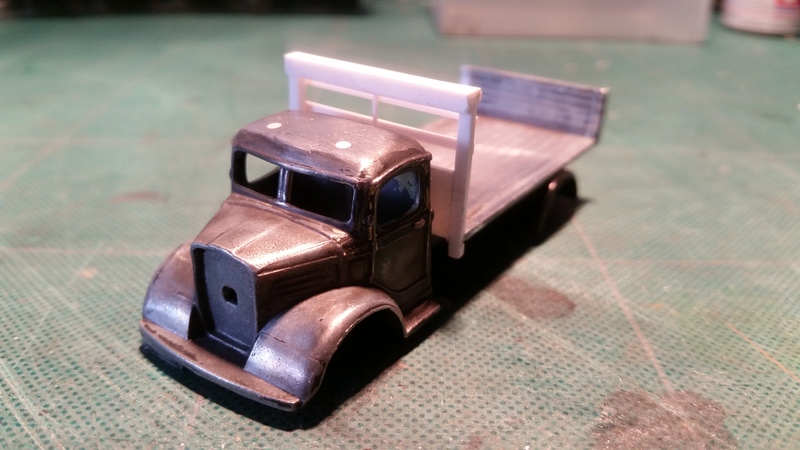 So last month I made a start on hacking about a Classix Austin K2 lorry to make Herstmonceux a new coal lorry. Having finished cutting it about I set about adding some new parts. I filled the holes in the roof and added some mirrors made from wire and microstrip. A new headboard for the front of the bed was need and this was knocked up from plasticard and microstrip. There seems to be a lot of different styles and I opted for a taller one, using photos for reference. With that done it was given a coat of primer and then some paint. Coal sacks were added, the cab glazed and then put back together. I still need to add a reg number and lightly weather the body but i’m rather pleased how it turned out.